And/or leveraged BRM to satisfy individual purpose and/or organizational purpose resulting in a recognizable impact on society. 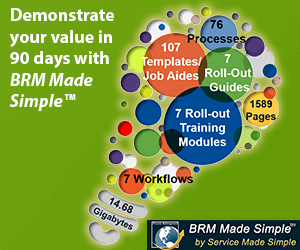 Your efforts are solidifying the success and adding to the credibility of BRM as a discipline on a global scale. Being recognized as a top BRM recognizes your impact on people, BRMs, and organizations everywhere. Thank you for making a difference! Annette is a consistent contributor. She fosters a collaborative environment that encourages personal and professional growth. She makes her colleagues feel appreciated. Annette openly shares successes and improvement opportunities in order to benefit the team. Annette earned her CBRM and presented this past year at the 2018 BRMConnect Conference. Over the past year, Chris has leveraged his CBRM knowledge and BRM excellence to build and develop solid partnerships, both existing and new, with his business colleagues and peers. Utilizing the Strategic Relationship Management Processes & tools such as the ‘Customer Value Hierarchy’ and ‘Relationship Strategy On a Page’, Chris has created trusted relationships that have enabled him and his fellow BRM team members to have strategic conversations with all levels of my organization resulting in being perceived as a valued asset and trusted advisor. Chris is now heavily involved in helping guide their business challenges by helping understand their business problems and as such have truly moved from what was considered and ‘order taker’ to a’ ‘trusted adviser’ while continuing the path of achieving that of a Strategic Partner. Working with his fellow BRM’s, Enterprise Architecture and administrative teams they were able to create an Initiatives Intake Process leveraged to bring unplanned and unique work to our Information Technology leadership team to help inform effective decision making. Through this process, he was also able to effectively communicate the business benefits created through building and strengthening internal partnerships with teams such as Enterprise Architecture. As part of the intake initiative, we have kicked off the expansion of our customized Customer Relationship Management System to improve collaboration, communication, and tracking of business interactions with our leadership team to help illustrate a clear portfolio picture for them to help mature Information Technology business planning processes. Cindy has been instrumental in helping transform the business towards more automated platforms for TECO’s customers–played a lead role in selecting AMI and Meter Data Management vendors for our TECO, selecting an Advanced Distribution Management solution which will help provide better outage management information for customers plus other things like a damage assessment solution. Cindy plays a large role in marrying Business and IT strategy alignment and lead monthly technology roadmap meetings for IT & business. She serves as a team member in the Grid Modernization strategy team for TECO. Cindy works with the business at all levels including at the Executive level to define key strategies for their technology needs. Cindy also works to communicate and understand concerns related to IT. She works with IT architects to understand new technology trends and make sure that there is a bi-directional collaborative communication between the business and IT. She very respectfully holds both the business and IT accountable for their deliverables. She does all of these exceptionally well. What in my mind makes her a truly great BRM is the trust that both the business and IT have in her. If IT is in a meeting with business and she is not present in the room, the very first question that the business has is: Where is Cindy and why is she not part of the conversation? That trust and respect including at the Executive level has taken years and a great deal of effort to earn. David has recently transitioned from the government sector to energy bringing his experience to his new employer. In his time with his new employer, David has been able to work with his Business Partners as well as fellow BRMs to offer comprehensive roadmaps and shared strategies, helping to breakdown business silos. He continues to work towards helping the Business Partner reach their long-term goals in conjunction with the Information, Technology and Telecom group. Gary has applied the BRM capability to his training and consulting company, formalizing their long-standing vision of “value delivered” with a focus on converging our capabilities with those of our client’s (now partner’s!). BRM education is driven by their business partner’s strategy and BRM is at the core of our services with 5 executive level trainers. As an Ambassador and Community Leader Gary has helped to grow awareness and adoption in Africa, and more recently in the UK and the Middle East. Gary’s major responsibilities are Employee Services IT support management across APJC. He has been in the position for over 5 years. His significant achievements have been achieved and a lot of transformational changes have taken place. Jeremy promoted BRM Institute to hundreds of new BRMs in the UK via LinkedIn, growing awareness and adoption of best practices. He became an accredited trainer in BRMP and CBRM whilst continuing being a practicing BRM. Jeremy has delivered BRM training to people, with a 100% success rate in the exams. He progressed maturity of BRM capability within Loughborough University, expanding the team and reach of the function. Jeremy has been instrumental in the onboarding of new IT Business Partners (IT BP)on our team. He is one of the senior IT BPs on our team and is frequently consulted for his expertise. Jeremy started in his role five years ago and supports both the Neurological (second largest Institute at Cleveland Clinic) and Endocrinology & Metabolism Institutes. He obtained his CBRM in 2018 and also his ITIL certification. In addition, he recently assumed the role of leading the BRMI’s Healthcare Community of Interest Group. Kim has championed the effort to bring BRM to LA County, and to build a sustainable program that can benefit their organization for years. Kim truly understands the benefits and value a well-defined BRM program can bring to LA County and has done an outstanding job in getting management approval for her vision. Her hard work, perseverance, and vision in developing and implementing this program is a model for others to follow. Malini is proactively initiating an Enterprise BRM approach in her organisation and has successfully engaged other corporate services. This holistic approach is already gaining executive attention and positive feedback from business colleagues. She is also in the process of establishing a BRM Community of Practice in the organisation to support BRM capability development. She has initiated the BRM Brown Bag podcast together with Suresh GP and Avinash Singh as a channel to engage and support BRMs in the Asia Pacific region. She regularly speaks at conferences and professional forums to raise awareness about BRM in Australia. She also supports the uptake of BRMP in Australia by participating in the showcase events organised by local registered training providers to share her experiences from the field. Maureen is a passionate, BRM subject matter expert and has made multiple contributions for the benefit of Clients and her firm, West Monroe Partners. Maureen has demonstrated her capability of treasuring and valuing cultures, opinions, and contributions by utilizing BRM techniques that have resulted in the maturation of relationship quality between the Partner & Provider teams for a client. Prior to her involvement, relationship maturity was measured at an ad-hoc status; this was confirmed by the limited number of proactive encounters that the parties involved that over time laid the foundation for a hostile culture. By using the Customer Value Hierarchy (CVH) and Relationship on a Page (RSoaP) techniques, she was able to understand and document the demands of the Partner while determining the availability of the enabling capabilities by the Provider. By clarifying demand shaping requirements and providing an opportunity for healthy engagement, the Provider organization was empowered to focus their time on value-added work that supported the vision and mission of the business. After 6-months relationship maturity can now be measured at a Trusted Advisor level. Maureen has also demonstrated the ability to blend BRM techniques with the Lean tool known as Obeya Room. The use of Obeya was engineered to serve as the vehicle for change management purposes to ensure that the commitments that were produced from RSoaP development activity were measured on a daily and weekly basis. The use of Obeya has been fully embraced to the point that the Client has asked for the assistance of a global roll-out of the tool. Maureen is an active advocate of the BRM body of knowledge and serves as a coach for her peers at West Monroe Partners. In addition to providing mentorship, she actively partners with various firm-wide Practices by demonstrating how BRM techniques can enhance Client engagements. Maureen has been recognized by Business Relationship Management Institute at the 2018 BRM Connect conference as being the first to receive a certificate experience after business impact as evidence of her work. She is actively working towards achieving Master of BRM (MBRM) status. In under less than a year after joining the Federal Reserve Bank of San Francisco as a Sr. Manager overseeing the BRM team, Michael Campbell has accomplished significant things like getting his entire team CBRM certified, raising awareness throughout the system on the importance of having a BRM as a strategic partner and gaining trust from business and IT partners. As a CBRM with York Region, Michelle, and the BRM team partnered with the Business and Enterprise Architecture group to create an Initiative Intake Process to support business planning and prioritization. This has provided a consistent method to receive and evaluate prospective technology initiatives, has enabled demand shaping and facilitated the allocation of resources to high priority initiatives. The ongoing partnership with enterprise architecture has furthered the business’s understanding of the benefits and value gained through leveraging the BRM and IT enabling teams. This has fostered a trusting relationship with the business and has allowed Michelle to conduct regular technology roadmap meetings with her business partners to discuss future technology needs, report on the portfolio status, and mitigate risks/issues. Robert has consistently worked to achieve significant progress with limited team resources. He maintains a strong network of personal contacts across his business partners base and is an advocate for their technology needs. During the past year he has spearheaded implementation of a new Integrated Library system, a new library Self-Check Out system, submitted and received E-rate approval for needed network upgrades, championed improved mobility and wireless connectivity at city attractions and instituted Community of Interest level Advisory Board and Steering Committee processes.